There’s a story going around about how much of the time the U.S. Apollo space missions are on course. Three percent, the story goes. The rest of the time goes to course correction. So it is with virtual teams. Cyberspace requires that for the moment 97 percent of our time is in course correction. We need good tools to navigate. The first place to start is at home, making virtual places to work that are good substitutes for physical places. This is a necessary early step. As people construct new places, they embed in them their models—consciously or unconsciously. A virtual team does not just replicate the functions of an old physical place online. It also generates a new conceptual space that never has existed before. New technologies are innovations that diffuse through society in well-recognized patterns. First, the new technology develops slowly against resistance, gaining a foothold by replicating and replacing functions of older technologies. Only after an innovation establishes itself as a good substitute will its truly innovative features and revolutionary effects come to full expression. Then its adoption rapidly expands through society. The cognitive characteristics of groups are blossoming in the fertile soil of shared digital environments. When virtual teams explicitly share their models using common technology, their ideas go beyond the members themselves. The database of the online team room reflects many people’s thinking, both in its overall information architecture and in the countless choices people make about their communications. Thus, a significant portion of the group’s shared intelligence and its ongoing thinking is expressed and retained in bits online. Rebecca Stillwater is a little nervous about her first meeting with the e-Experience Strategy Team on the first Monday after New Year’s. She joins just as the group kicks off its implementation phase. The “e-Ex” Strategy Team (eXST) was set up six weeks earlier. The company has successfully met its e-commerce targets and now is into e-service development. This long-range thinking group is to look at how the company is going to get ahead of the web curve. Several vice presidents and one of the founders are members of a 17-person virtual team from all levels and regions within the company, as well as several outside consultants, a key vendor, and two customers who are co-development partners. Like most people in the company, Rebecca already has stopped by the team's web site to look at its “outside” walls. The team's purpose, its members and how to contact them, (and its open positions) are visible to all. Rebecca sees the need for her skills so she posts for the team and is accepted. Rebecca is receives the login keys to the online room a week earlier as the team is wrapping up its launch activities. Ideally, she would have been there as the team forms and storms its way to a clear set of goals. But the need for a systems architect only emerges as the team deepens its thinking about how to achieve concrete results quickly. In the few days she has before the holidays, Rebecca gets an inside view of the team's current status at year's end and how it got there. Clicking “OK” on her password brings her to the team's Portal Page, which seems to change hourly in these last frantic days before Christmas. The room is in rapid flux as the team concludes its launch. A new graphic of the team’s envisioned result occupies a place of honor under its name and logo. Announcements and links to key documents straddle the central hot map that points to more detailed views. A navigation bar points her to the room’s four walls, team discussions, the file library, a team directory, and the company's internal portal page. She clicks on the top of the icon and presto she’s at the Time Wall. An agenda outlines the upcoming meeting, along with the expected pre-work for it and pointers to related information. A weekly schedule for the team is to the left side of the wall, while announcements for sub-team events line the right side. Below, there is a Gantt chart that summarizes current tasks in little bars of time that chunk past, present, and future. Scrolling to the bottom of the wall brings up the big picture of the team's life cycle and its major milestones. Attached to this picture is a timeline history of the work process, meetings, and discussions that led to this moment in the team's life. Perusal of this material keeps Rebecca up very late one night, but she appreciates the insight into the group's thinking as well as getting a feel for some of the personalities. Another click and she faces the Purpose Wall. On a “peg” at the top is the team mission, which someone has fancifully done up as a needle-stitch graphic. Already familiar with the vision and mission from the “outside” view of the Purpose Wall, she is intrigued with the internal goals developed by the team. These goals serve as the centers of agreement for the sub-teams now hard at work. She clicks on a goal and it unfolds into the next level. Detailed tasks, meetings, intermediate results, and decisions expected from the sub-teams all appear. Curious, she clicks on a task labeled, “Explore database options” listed under the technology goal to see who is involved, the timing, budget estimate, and associated deliverables. Looking for more detail on the technology sub-team and its members, Rebecca clicks to the People Wall. Using the sub-team button, she displays the names, roles, and locations of members in the central panel. A click on the name of one of the co-leaders brings the smiling face of Brahm Rogers to the screen with some basic profile information alongside. He’s included a link to his personal web site where she learns Brahm’s been at the technical forefront of network developments—and he loves to ski. Returning to the People Wall with the navigation bar, Rebecca selects the outline icon and brings up an extended organization chart that is anchored in the middle by the strategy team. Sub-teams and members flow down from the team, other teams and related organizations reach out horizontally, and the sponsoring organizations fan out above the team. In a few minutes, Rebecca feels she has a clear view of the team's context, especially after reviewing the web sites of several unfamiliar sponsoring groups. A ski fanatic herself, Rebecca is about to send a message to see if she can arrange a slope-side hello over the holidays with Brahm, the co-leader she profiled, when she wonders what the team's protocols around e-mail might be. So she clicks over to the Links Wall and hits the e-mail button. This brings up access to team lists, an ability to send or cc: e-mails to structured discussion topics, and the team's six rules of e-mail etiquette—including an open invitation to send personal notes. However, she sees on the electronic In/Out indicator that her intended recipient is incommunicado for a week. Other buttons lead to information about using conference calls, setting up virtual meetings using a web-based real-time communications system, and an open item on setting up a regular video conference with one of the customer partners. An especially valuable instrument on this wall is the map of conversations. Access to the flow of dialogue from the earliest online meetings give her a real feeling for how the team talked its way to its current clarity. Here, too, is the source for much of her fledgling knowledge of the styles, experience, and expertise of her new team members. Below the map is a dense catalog of links, a team bookmark list to key resources in the company, applications central to the team's mission, and critical outside information sources. She also chooses to generate and print out a complete high-level process flow chart that summarizes the team's planned work (Figure 11.1). It provides her with a map of the working relationships needed to accomplish the team’s mission. In his welcoming note with her login information, Brahm introduces the online room as the team's collective memory. A real-time memory, he says, of the group's thinking and interactions that has been recorded by, reported on, and tracked through the technology underlying the team room. A new member like Rebecca has access to a wealth of familiarizing information organized in the natural context of the team's development and work. He also characterizes the online place as a “living status report,” the current state and focus of the team. He says pointedly that team members are expected to spend time in the room prior to leadership meetings. Synchronous (real-time) together is precious and not to be used for round-robin informational briefings. A few minutes before the appointed time, Rebecca logs in to the team room, and clicks on “Attend Meeting”. This milestone event is designated a “shared click” meeting, meaning that the team uses a web-based, real-time work environment that gives them shared white boards, click paths, applications, and polling facilities. “Self-click” meetings combine a conference call with everyone on the web clicking themselves through the agenda as the team “walks around” the room. Rebecca finds herself looking at a fresh and somewhat revised agenda posted on the Time Wall, a schedule sprinkled with links to relevant locations in the room. Alongside is an empty area entitled “Meeting Notes,” and at the bottom is an empty table for “Issues and Actions.” More interesting is the banter of voices as new people join the meeting and conversation flows through an “open mike.” The tote board shows that almost everyone has gathered as the appointed time rolls around. Brahm opens the meeting by reviewing the agenda and then suggests taking a few minutes to introduce their newest member. He asks the team to click to the People Wall, where everyone sees Rebecca's picture centrally displayed. Her profile information (which Rebecca makes a mental note to complete) is to the right. On the left, a slice of the team's extended organization chart displays her “home” group in context. Rebecca has had time to think about what she wanted to say about herself. She finishes with a quick review of the skills and experience that she thinks most relevant to the team's mission. Making a few notes in the team identity table as she speaks, Brahm posts his summary and asks Rebecca if it is accurate. Brahm transfers attention now to the Purpose Wall. There’s a major planning issue the team needs to address, the impact of the XML-software standard on their partnering strategy. They review goals of the two sub-teams involved and vigorously debate the significance and how best to assess it. It’s clear that most people need more information and time to think about the issue. So the team agrees to set up a week-long conversation on the topic and to create an additional task for the technology team to track. Quickly setting up the task, Brahm then saves an empty “XML Strategy Document” that will contain the concrete result of this activity. He also creates an empty “decision” item for the team to fill in as the designated online conversation wraps up by week's end. Bringing the team to the conversation outline on the Links Wall, Brahm asks where best to locate this new technology topic, immediately following the suggestion to put it in the strategic dialogues. The group has made the real-time placement of key topics into an ongoing map of conversations almost a ritual. They acknowledge the dialogue's importance while providing a practical visual cue as to where it is taking place. The group moves to the relationship map, which shows who is involved with each task. The new task is highlighted in anticipation of deciding who will take responsibility for this activity. With a click, the group is in the Product Room, configured in a design that reflects the components of the group's output. The graphic of the team's product appears with richer detail about how the elements combine into a whole. Today's focus is on the service component, and three people speak about the significance of new documents posted here. They conclude with a request for help in reviewing several web sites that look competitive with their intended offering. Several sub-team leaders then point to particular areas that are the subjects of meetings in the upcoming week, inviting anyone to join but calling attention to expected attendees. With 15 minutes until the end of the real-time web meeting, the group moves back to the Time Wall to review meeting notes and action items collected through the meeting. They use a technique based on the U.S. Army's After Action Review to assess what is supposed to happen, what did happen, what worked, what didn’t, and capture learning to add to their compendium of best practices.1 The meeting ends with a brief appreciation and request for final comments. We cannot tell a lie: Virtual teams are complex. They have all the complexity of any group–and then some, magnified by their distributed nature. To navigate intuitively through the team space, create online functions that support “natural” teams. In the scenario of using a virtual room above, we include functionality that supports three typical ways teams hold their information—in a place, plan, and handbook. For millennia, new communications media have improved the ability to push information. With digital media, the historic trend to push only is suddenly paralleled by dramatic new capability to pull—seeking and finding the information you need when you need it. In a “pull model” of information access, particularly where users are both readers and writers, it is vital that everyone share common views of what information goes where when. Hence the value of creating a common online place. The World Wide Web stands out as the defining tool of the new world of virtual work. This vast new cyber territory, which at the millennial dawn is still a global frontier, includes the Internet and the even vaster matrix of all interconnected computers inside and outside the planet's organizations and homes. An almost ideal medium for shared mental models, the web combines anytime-anywhere availability with an unrivaled flexibility of expression that embraces all other media. At the hub of the web is the link, not even a proper technology but a pure package of information, an address tag—the URL (Uniform Resource Locator). On the web, you can link anything represented as information to any other information anywhere. Most remarkably, you naturally put these links into context, however consciously or unconsciously constructed. A team's web site is a place to clearly and explicitly grow its common information and shared perspective. The web approach to team intelligence scales completely. Team places range from the use of personal home pages (like those offered by many Internet service providers) or they may plug into internal enterprise networks, where they may leverage vast resources, like at Sun. Modeling tools can combine product and process views at any level of complexity. 	A virtual team web site can be as simple as it needs to be. A single home page with a name banner and clickable pointers to current events, purpose, people, and communications may be all you need. A typically complex virtual team can create a two-level site, a portal home page and four main pages for the walls, as described above. A very complex longer-life team can build out its basic process room to a multi-level structure. Sub-teams set up rooms using the navigation model of the main team room. Together they create a “product room” with walls for major components that act as common navigation for the team’s specific work. 	Programs and enterprises use the web with all its interactive power to create visible dynamic models of teams in the larger context of many other teams. Sponsors, leaders, and members of multiple teams in particular appreciate the ability to navigate between and within team rooms using the same language for online work. Remember that there are no rules for what you can and cannot do. Regardless of what information you share, just the fact that you keep it online is a tremendous source of common experience and pride for your team. The picture of progress in the Industrial Era is the sloped straight line of linear process. 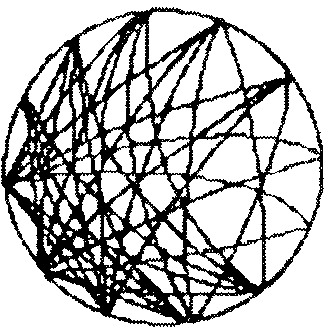 Progress in the Information Age is a spiral of iterations of widening scope stretching out along a life cycle. The combination of speed, complexity, and the change so emblematic of our time demands a different approach to the future than a one-time, fixed plan of action. Detail the short term, sketch the long term, and fill-in as you go. The explicit, visible models that teams create are easier to access and depict than the models that people hold in their heads. As distributed work becomes more complex, digital media is the only way to make the team’s shared models come alive. Computer-based tools can help you display and update your team’s work. We like a people-oriented process model of virtual teams (Figure 11.1 in the scenario above) based on a method called “deployment flow charting.” This approach is pioneered by Dr. W. Edwards Deming and first extensively employed by Toyota in the 1960s.2 Myron Tribus is credited with developing the icons and elements for a general language of process design and representation.2 TeamFlow3 is an artfully simple application for modeling and managing virtual team processes using this technique. At the heart of the deployment planning method is the relationship matrix (Chapter 10, Step 6) that reflects agreements about who is doing what. In the virtual team room, you in effect can walk inside your plan. Many of the displays and dashboards on the walls reflect an underlying planning framework that touches all the bases of being a team. 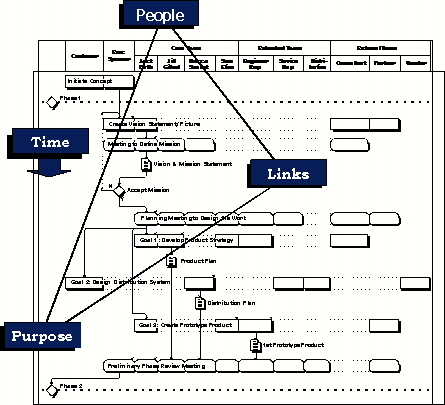 By using People-Purpose-Links-Time to organize the heart of the team space, you make the principles concrete and useful. Purpose. Goals serve as headings for groups of tasks and results. Tasks and meetings represent chunks of activity. Results and decisions appear as output elements and stored as files. People. Members, individual and organizational, comprise the rings of team boundaries. Symbols on the tasks and other process elements designating roles indicate leadership. The hierarchy of the organizational chart and the levels of detail in the workflow reflect levels. Links. People access media through addresses in directories, pointers to attachments, and URLs everywhere to anywhere. Interactions happen over time, indicated by the workflows and conversations connecting people. The matrix of people and purpose represent relationships among members. Time. Calendars include team-specific result deadlines, task completion milestones, and scheduled events as well as holidays and other organizationally-significant dates that impact timing. Project timing is associated with each process element and summarized in a Gantt chart. Phases through milestone decisions and events mark the life cycles of the maturing team. As a team moves from launch to implementation, it accumulates considerable detail about its work. Within the room, the group compiles what traditionally would appear in a team handbook. The virtual team handbook functions as the basic shared but selective “information place.” It’s a common resource for team members while serving as the guidebook for new members. You can generate a physical handbook from the information in the room, whether as a small document or packaged as a file folder or three-ring binder. A “carry-it-around” handbook of key information is useful in conjunction with a more extensive web version. Put plan components like the relationship matrix, team directory, and other common information in the handbook. This can be a very low-tech and uncomplicated way to manage a simple team, or a soon-to-be-complicated team in its early stages. The launch plan ideally contains enough detail for alignment without being so detailed that it unnecessarily constrains people. Places, plans, and handbooks are ways to organize, simplify, and navigate shared information and intentions. As we become more adept at representing these functions online, we will only accelerate our already dizzying displays of information. Our ability to grasp it as a whole depends more on the integrity of the underlying frameworks and theory while “surface” data changes more rapidly. Theory makes deep navigation possible.